The Irish State twice misled the UN yesterday in Geneva about religious discrimination in access to schools. In both cases, Atheist Ireland was there to explain the true position to the UN Committee, to enable them to question Ireland more accurately. Firstly, when answering questions about religious discrimination in access to schools, the Irish State raised the Admissions to Schools Bill without admitting that it retains the right to discriminate against children on the ground of religion. In fact, the Bill was designed to specifically not address religious discrimination. Secondly, the Irish State told the UN that the Minister for Education had said she will change the Equal Status Act to stop schools discriminating on religion in access to schools. In fact, she has said the opposite – that this Government will not change the Equal Status Act, as they say that it would require a referendum to do so. We highlighted the Admissions to Schools Bill at a briefing meeting with the Committee before they questioned the Irish State. We anticipated that Ireland would create the impression that this Bill would address the problem, and that they would concede only that it might not be passed because of the coming general election. We told the Committee, at and after that briefing meeting, that this Bill specifically did not address religious discrimination in access to schools. It allows this to continue under the euphemism of ‘lawful oversubscription criteria’. We told the Committee that whether it was passed before the election was irrelevant, as the religious discrimination was still enshrined in the Equal Status Act. As we predicted, the Irish State raised this Bill in their answers to the Committee. They did not explicitly say that it would address the problem, but nor did they say that it was designed to not address the problem. Fortunately, the Committee was prepared for this evasion, and they asked a follow-up question. The follow up question was: in order to remove religious discrimination in access to schools, would you not have to also change the Equal Status Act? The Irish State replied that that was true, and added that the Minister for Education had committed to doing this. We will have the actual transcript later to verify the exact wording. This led to some confusion on social media, with the impression being created that the Minister had made a commitment to amend the Equal Status Act. Obviously this was not true, as if it had been, it would have been a major initiative that would have been heavily promoted in the State’s written submission to the UN, and by the Minister for Children in his introduction to the session. Actually, the Minister and the Government have made clear that they will not be amending the Equal Status Act to remove the right of publicly funded religious schools to discriminate against children in access. The Government says they cannot do this without a referendum, as they say they have a constitutional obligation to buttress religious discrimination. This answer by the State blurred an important distinction in a democracy. What the Minister for Education has said is that the Labour Party manifesto will call for this law to be changed in the next parliament. But that is a party political promotion, not a position of the Irish Government. We should not allow our political system to conflate party positions and State duties. 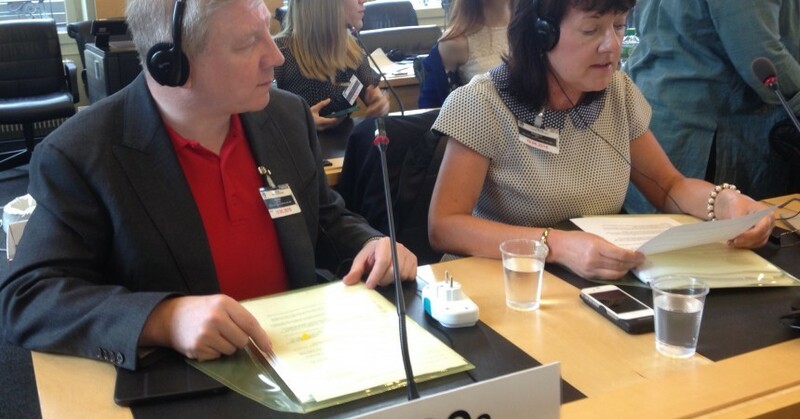 Atheist Ireland informed the Committee’s Rapporteur who was dealing with education questions about this. He acknowledged the distinction we had highlighted, and said that the Committee would be aware of it when deciding on their concluding observations. We also raised this with the Irish media present, which resulted in the Minister for Children being asked after the meeting about the statement. He confirmed that changing the Equal Status Act would require both a Government decision, which he said had not been made, and a referendum, which he said would be up to the next Government after the election. This is only one of many issues in recent years where it has been important to have an Atheist Ireland delegation present when UN human Rights Committees, and other international human rights bodies, are questioning Ireland. We are confident that, when the UN publishes its concluding observations on 4 February, it will add to the eight sets of findings from various UN and Council of Europe bodies in recent years, telling Ireland to stop breaching our human rights. Atheist Ireland had very positive interactions with the Committee here, during our formal and informal briefings. While people in Ireland tend to see our school system as normal, we always find that legal experts from other countries are amazed at the entanglement of church and state in Ireland. Atheist Ireland is pleased that the UN raised the problem of religion being integrated throughout the curriculum in Irish schools, as well as its consistent calls to Ireland to provide nondenominational schools, end religious discrimination in school access, and enable opt-outs from faith formation. Are the Schools Equality PACT reforms, to protect human rights, unconstitutional? May I ask why people who adtvcaoe secular education never seem to give any backing to the idea of funding all schools equally regardless of whether they have a faith based ethos or not. Would the funding of all schools equally not be more egalitarian than saying that only schools with a secular ethos should receive public funding. Why should those who are sincerely Muslim, Christian,Jewish etc. not be able to attend an institution that serves them rather than having to attend religious education only at weekends, as is often proposed. It seems that those who favour secular education are attempting to control the choices that religious people can make as regards education, by making secular education the only choice. If those who want secular education receive public funding is it not only right an fair that those who want a faith based education get the same amount?